For anyone who ever wanted to be listed on the closing credits of a film, your chance has arrived online. 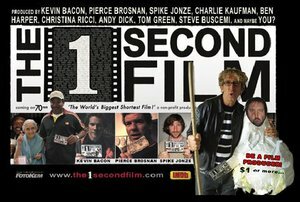 The 1 Second Film is a nonprofit collaborative film project that has stated a single simple aim … to create "The World’s Biggest Short Film." To do it, the project is enlisting donations of $1 or more from anyone and everyone. Each donor will be listed as a Producer in the 90 minute long credits of the film, in order based on amount of donation. The actual 1 second film will consist of an animated sequence of images taken from 12 giant 5ft by 9ft paintings, each of which was individually directed and contributed to by hundreds of artists in March of 2001. The unique idea behind this film has already generated significant interest, but this is not meant to be a one-hit wonder campaign, as the Million Dollar Homepage became. The 1 Second Film project is actually an ambitious 5 phase program through 2011 (on 11/11/11 to be exact), culminating in the creation of the 11,111 Second Film – an animated feature film created by millions of people during thousands of simultaneuous events around the world. In each phase, the campaign has chosen a different cause – from women’s rights in the first phase to global warming and global poverty in subsequent years. As it stands, the project is a wonderfully creative concept with hooks to engage a loyal community of "producers," an ambitious mission and a focus on encouraging collaboration (both in creating art and funding the project). It is another in a string of highly creative and ambitious social marketing projects online led by visionary individuals that want to do more to help a social cause than simply write a check to an existing charity. There are definite signs that this individual-driven super activism is on the rise, such as the fact that in the aftermath of Hurricane Katrina, more than 7 million Americans set up their own hurricane relief efforts on the Internet. Clearly there is an emerging area of user generated media focused on charity – as shown by these individual efforts, as well as campaigns like the 1 Second Film, the Invisible Children campaign, and the Cancer Mosaic. As more and more passionate individuals go beyond simply donating and launch charitable efforts of their own, the 1 Second Film seems to illustrate that the landscape of social marketing online may be poised for a similar shift that traditional media has experienced with the rise of blogs and personal media.